I am a farmer and I want a tool to remotely know what is happening in the environment because I can't be everywhere all the time. A Pipe is a device that directs the flow of data from a sensor to the place of the Pipe owner's choosing. 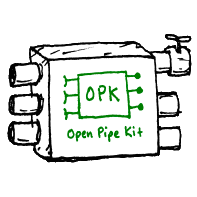 With Open Pipe Kit it's easy to build Pipes, even for folks who don't program. That means a Pipe will be in the places where you can't always be and you'll always know what is going on. You can send data to Google Sheets, Farm OS, Adafruit.io, and many other places. Check out https://OpenPipeKit.github.io. for guides on building your first pipes. Join the conversation on this project, join our email group.